PhD student Leila Ali Cavasonza reports on a her recent work on indirect dark matter searches. Investigating the nature of Dark Matter is certainly one of the most compelling and exciting goals of particle and astroparticle physics nowadays, both on the experimental and on the theoretical side. It is now almost universally assumed that the Dark Matter consists of one or more new particles. According to the observations, this new particle is neutral, non relativistic, massive, weakly interacting and with a small self-interaction cross section. One of the most prominent candidate are the so-called Weakly Interactive Massive Particles (WIMPS). These particles could interact with ordinary matter and be detected in the so-called direct detection experiments. Or they could be produced via annihilation of standard particles and discovered at colliders. Or they could annihilate into standard particles like photons, electrons and positrons or neutrinos and produce an excess in the fluxes of standard model particles observed in cosmic rays. 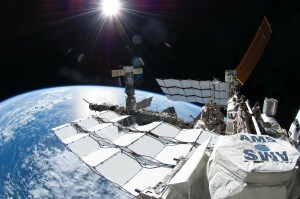 Indirect detection experiments, like the Alpha Magnetic Spectrometer (AMS, see left figure) measure the composition and the fluxes of the cosmic rays with very high precision in order to detect such possible excesses. The AMS experiment has actually found a significant excess in the positron fluxes, that is at the moment not explained by standard astrophysics (figure below). On the other hand no excess has been observed for example in the antiproton fluxes. 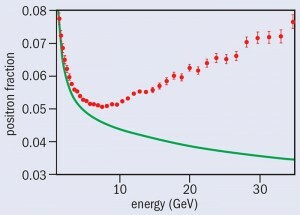 The positron fraction measured by AMS (red circles) compared with the expectation from ordinary cosmic-ray collisions. To explain this situation, the so called leptophilic models for Dark Matter have been introduced: According to these models the Dark Matter particles can annihilate only into leptons, like electrons and positrons, but not in hadrons, like the antiprotons. However, the situation is not so simple. A very energetic electron produced via WIMPS annihilation can actually radiate a Z or W boson and produce at the end all stable standard particles, including antiprotons. To have a consistent picture and accurate predictions for the AMS experiment in the frame of leptophilic models it is then necessary to take into account the electroweak radiation off the standard model final state. The so called fragmentation functions approximation has been developed in order to include these contributions in a simple and model independent way. In our paper arXiv: 1409.8226 we analyse the quality of this approximation. In particular we produce predictions for the AMS experiment within a simple leptophilic model including the electroweak radiation in the complete theory and with the approximation respectively. We then compare the predicted fluxes to understand how reliable the approximation is. It turns out that for some models the approximation is not valid. On the other hand, when valid, the approximation is actually very reliable and it is possible to obtain accurate predictions in a faster and simpler way.